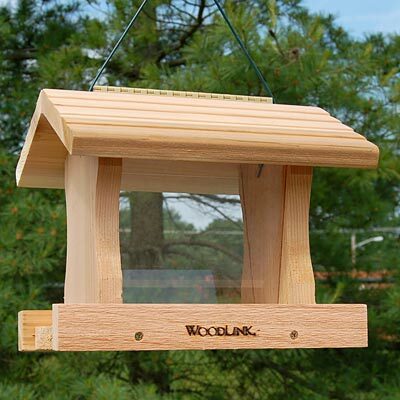 Provide birds their favorite seed with rustic charm using the Woodlink Large Deluxe Cedar Bird Feeder. The familiar shape and durable construction will surely make this unit a favorite for both you and your feathered friends. Its pitched roof, with lapped detailing, protects the generous seed reservoir, and lends a classic silhouette to the unit. Two clear plastic panels help form the reservoir, which holds 1.75 quarts of sunflower seed or cracked corn. These panels angle inward, helping direct seed toward the feeding platform, where two ledges form perching area. The sides also keep the seed levels visible, and one fully removes for thorough cleaning. A hinge in the center of the lid allows one side to open, so you can refill the item easily. The cedar body forms a rot resistant feeder, and the attached cable makes hanging the unit simple. Enhance the rustic feel of your backyard with this Large Deluxe Cedar Bird Feeder. Made in the USA.